Added to the 2018 Volkswagen range is the new sharp looking Tiguan SUV. Distinctively a new VW even by the fact that it has extensive VW panel creasing matched with the plenty of decent chrome detailing. All-in-all the latest Tiguan looks very upmarket and also offers ample space. Seven seats is always handy, so if you need that extra accommodation then the VW Tiguan Allspace will be the model for you which is longer than the standard five-seater Tiguan. It’s a bit more expensive too. 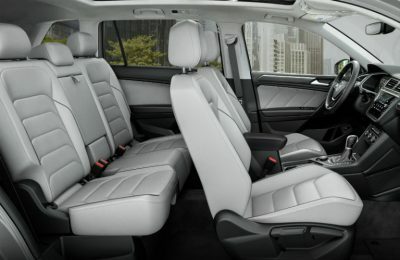 It’s worth mentioning here that the Tiguan Allspace third row seats are really only for small adults and children. Your average size adult just won’t feel comfortable back there. Second row and front seat accommodation is however very roomy and decently comfortable. Second row seating is slide adjustable for mixing and matching the body shapes. There is also a foldable middle section in the second row rear seats for carrying longer items. Plenty of storage space throughout the cabin is very good. A 12 V socket, USB charging and air conditioning points are available to second row occupants. Luggage space with the third row seats folded flat is copious, and there are all sorts of little accessories like tie down hooks, a torch and even another 12 V socket. An electronic tailgate is a nice feature. The uncompromising Tiguan boasts a class-leading 615 litres luggage capacity. Tiguan Allspace buyers will have 700 litres with five seats in place, and an impressive 230 litres when all seven seats are in use. What’s it like in the front seats? Actually it is very nice. VW have provided some very comfortable seats that have hours of comfortable driving written into their design. There is big space for all shapes and sizes, and huge door storage bins that will hold bottles. These bottle bins are lined with felt to stop things rattling around and becoming an annoyance when driving. USB points, and a 12 Volt socket is also present in the centre console under the dash. Ergonomics is excellent, with all the instrument panelling, switchgear and gear levers all feeling just right. The multifunction steering wheel does a superb job of controlling your speed, audio functions, communications and even just steering because the steering wheel is beautifully soft and a snugly comfortable fit in the driver’s hands. A Tiguan cabin is a nice place to drive away your daytime hours, and when the sun sinks low in the horizon the new Volkswagen Tiguan has a beautifully crisp interior lighting that has a selection of ambient colours and displays. Modern graphics and top technology equate to a very pleasant cabin for long hauls. Premium models also offer three-zone climate control. Standard on all Tiguans is the premium 8-inch touchscreen with superb graphics and very user-friendly controls. Android Auto and Apple CarPlay are nice features for those with musical ears. Smartphone connection means that the system is a breeze to use and will automatically alert you to incoming calls and texts. Voice control also makes travelling inside the Tiguan modern and nice. Satellite navigation keeps you on the ball. A choice of driver’s instrumentation is available; so you can have the traditional analogue look or you can have the modern digital display. The modern digital appearance is very nice and is worth the upgrade cost. The eye-catching Active Info Display, part of the optional Driver Assistance package, takes the place of the traditional instruments that sit behind the steering wheel. This 12.3-inch high-definition digital screen, with configurable views for navigation, infotainment, driver assistance, off-road and vehicle performance functions, puts everything you need right in front of your eyes. You’ll find that either the standard Tiguan or Tiguan Allspace ride very nicely over all road surfaces, and if your commute does involve some tough secondary roads then your new Tiguan is a super confident performer. The big SUV soaks up the pot holes and undulations while remaining well planted and in control. 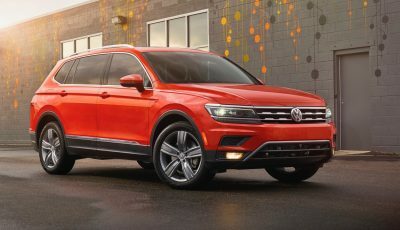 AWD versions of the new Tiguan are available and come with various off-road modes which control the level of traction available. The AWD system is controlled via the round dial on the central console. On the road, any of the Tiguans are lovely to drive. They are quiet, relaxed and grunty. Even though there is some weight in the design, the Tiguan gets you around corners very well. You can opt for a driver mode which allows you to soften or harden up the suspension should you feel the need. Your new 2018 Volkswagen Tiguan is very safe. Features like multi-collision braking, Park Assist, a rear-view camera, adaptive cruise control, a 360 degree birds eye view, emergency braking and all the airbag safety you can imagine are standard. Three petrol engines are available for Tiguan and Tiguan Allspace buyers, while two diesel motors are available for the Allspace only. Petrol engines include: 110 kW 2.0-litre TSI engine (Allspace only), 132 kW 2.0-litre TSI engine and a 162 kW 2.0-litre TSI engine. Diesel engines include the 110 kW 110TDI or 140 kW 140TDI option. All versions are powerful and smooth, but it’s probably best to steer clear of the smallest petrol if you intend to do lots of open road travel with the seven seats fully occupied and luggage on board. 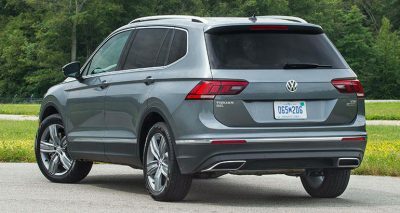 For any more information on the new VW Tiguan and Tiguan Allspace SUV models or, for that matter, any other new car, contact one of our friendly consultants on 1300 303 181. If you’d like some fleet discount pricing (yes even for private buyers! ), we can submit vehicle quote requests out to our national network of Volkswagen dealers and come back with pricing within 24 hours. Private Fleet – car buying made easy!